Here is the last batch from my Technique Tuesday camellia crazy card making spree. This top-folding card was really fun. I stamped the first camellia in the upper left hand corner, then made a mask and stamped all over the card using Wendy Vecchi’s archival Watering Can grey (from Ranger). Check out the teeny camellia in the lower corner! I stamped the camellia on scrap white card stock (using that same Wendy Vecchi watering can ink) then painted it using my water brush and Ranger/Tim Holtz Distress Markers (Tattered Rose, Victorian Velvet) and some leftover green ink on my palette from my Faber-Castell PITT brush markers. When the piece was dry I cut out the center of the flower, plus two leaves. I stamped and black embossed “Beautiful” (Technique Tuesday) on a strip of vellum, which I attached by wrapping the band to the inside of the card, attaching with Scotch Brand vellum tape. I also anchored the vellum on the front, using the same tape, where I knew I would put the flower, which I attached with foam squares. The final touches included a dab of Ranger Diamond Stickles on various flower parts a few Doodlebug Designs sequins, attached using Glue Dots micros. So simple! 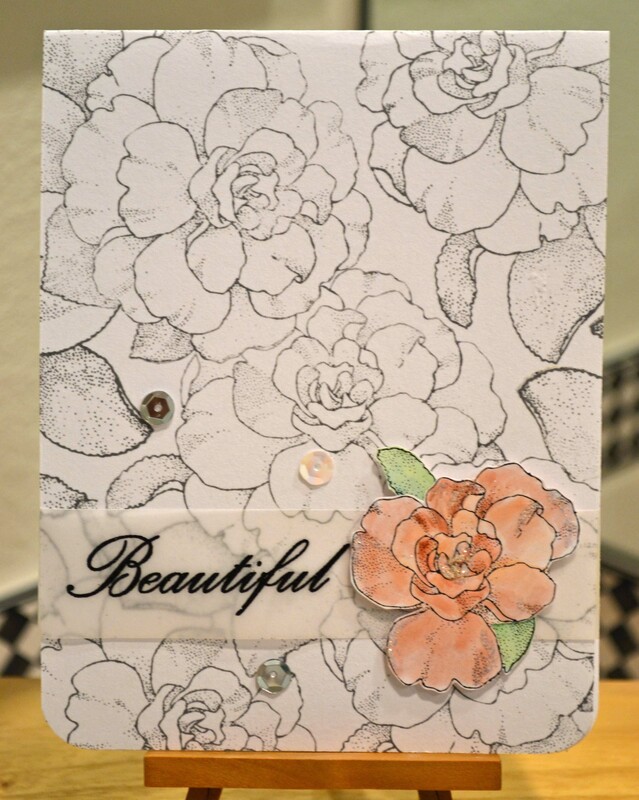 Stamp the camellia in grey in the lower right corner of a white card stock panel, round the corners and mount it on a Paper Source cement card front (also rounding the corners). Die- cut “happy” (Technique Tuesday) twice, layer the two and adhere to top of card. I added some Ranger Glossy Accents for shine and stamped “everything” beneath it. A few Dew Drops from Robin’s Nest, a black Hero Arts gem and bam! I’m done. Everything was glued down with ScraPerfect Best Glue Ever. In my last post, I showed my first experiments using Avery Elle’s nifty Custom Panels die set, which has so many possibilities! To finish this top-folding card I stamped and embossed (in white) two flowers and a butterfly (both from Stampendous!). 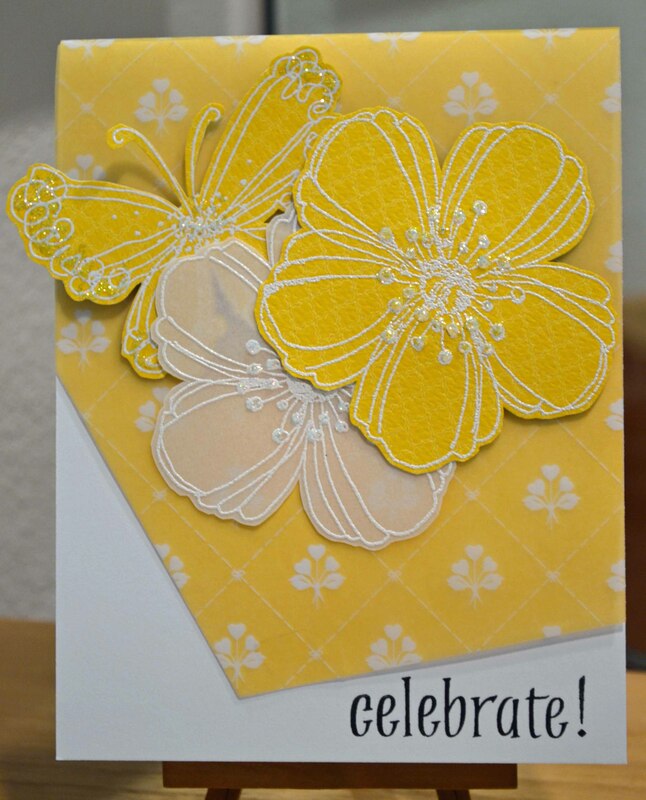 One flower was stamped on vellum, the other flower and the butterfly were stamped on a patterned paper from Bazzill Basics. They were adhered with Tombow Power Adhesive Tags, which I like because they are clear and not too thick. I stamped Celebrate! in the lower right hand corner using black ink. A little Ranger Diamond Stickles was the finishing touch. Here’s the last of that batch! Whew! And a very simple card, indeed. Using a Spellbinders Rose Creations die, I cut the three smallest petal shapes, plus the leaves, from the Core’dinations Gemstones paper, held them together with a brad from Eyelet Outlet, and attached to the card using Pop Up Glue Dots. First, I gold embossed on scrap paper, then cut three pieces using the pie shaped die. I stacked the pieces on the left side of the card. Ad a sentiment (Hero Arts) and bam! Done! 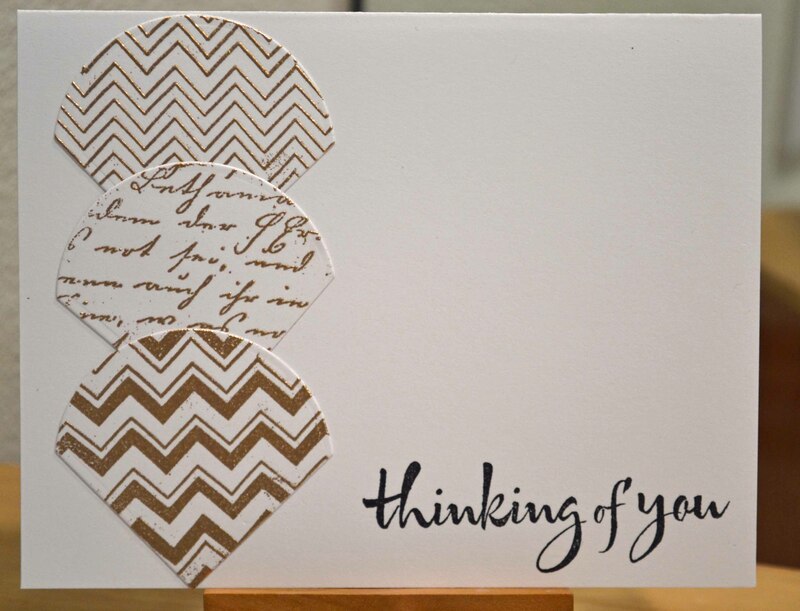 The chevrons are from Lawn Fawn backdrops, the text from Hero Arts Old Letter stamp. I believe the sentiment is also Hero Arts. First, I die cut a piece from white scrap paper using the Avery Elle curved die, then dry embossed it with a Cuttlebug pattern. (Tip: Die cut first so you don’t flatten out the dry embossed portion when you run the piece through the die cutting machine.) The balloon animal and sentiments are alsofrom Avery Elle. 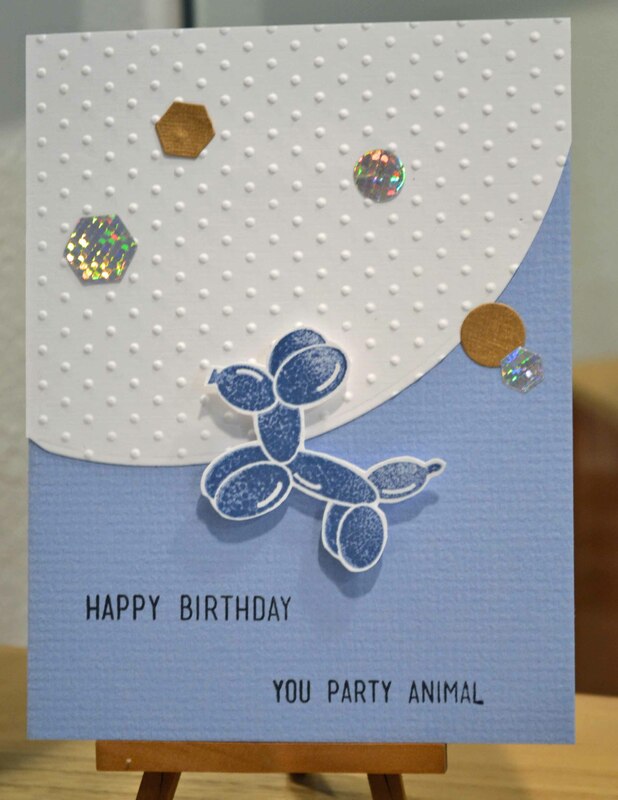 The balloon animal was stamped in a denim blue, fussy cut, and popped up with foam squares. 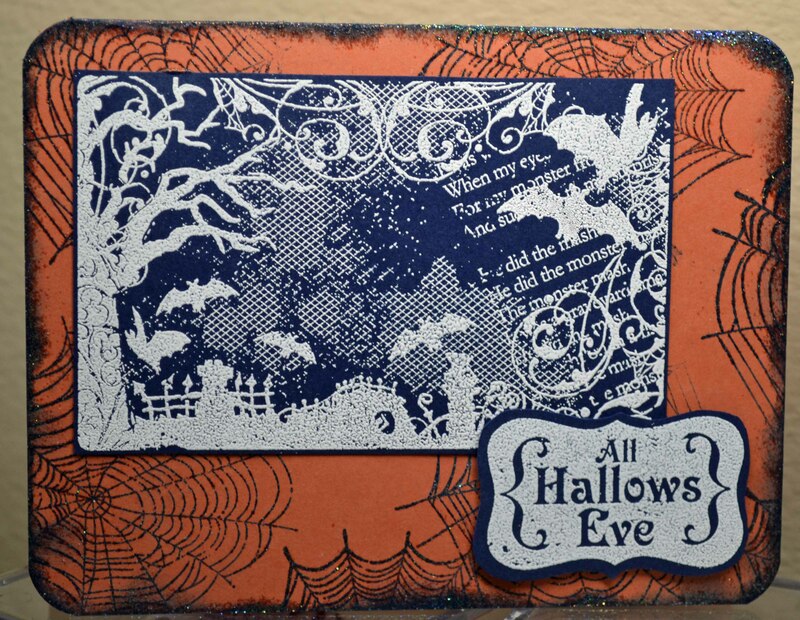 The embellishment pieces were die cut with that same Avery Elle die and glued randomly. That’s a lot of dies in one package! Check it out. 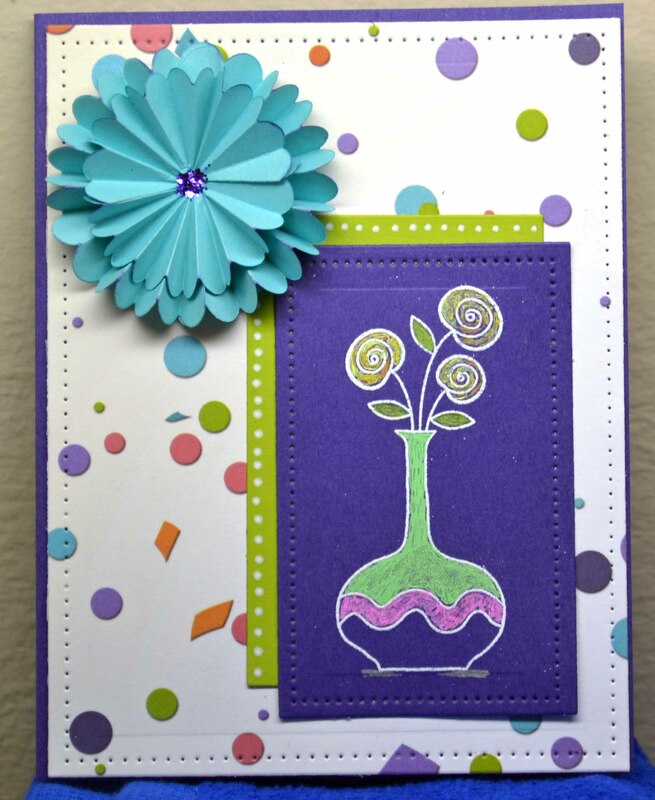 In my last post, I showcased some fun selections from Spellbinders’ Celebra’tions collection by Richard Garay. 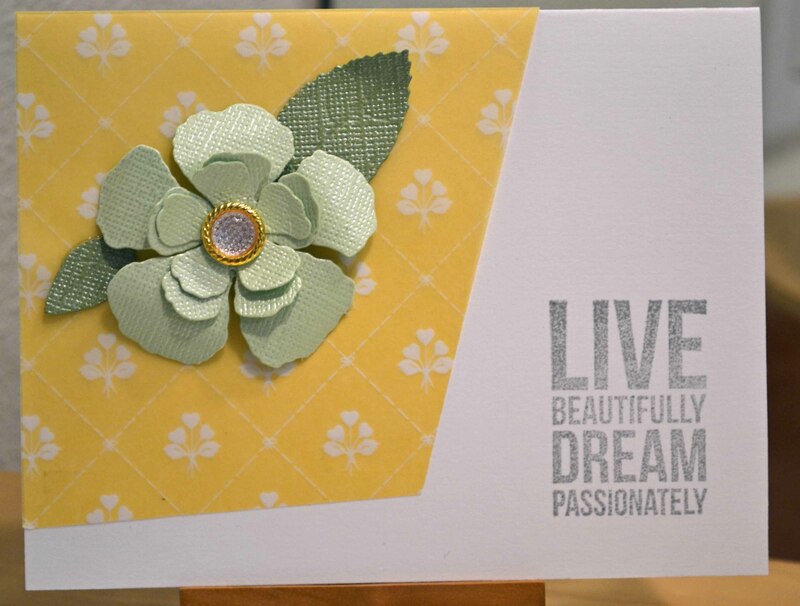 This card features a piece of pretty patterned paper as well as a rosette made with the rosette die. (I added a dollop of Stickles Glitter Glue to the center). The stamp is from the # Sweet set and is colored using bright gel pens. The white dots were added to the green layer using a white dot pen from Faber-Castell (one of my must-have tools!). The patterned and purple pieces were cut using the Pierced Rectangles die (the green was a leftover!). 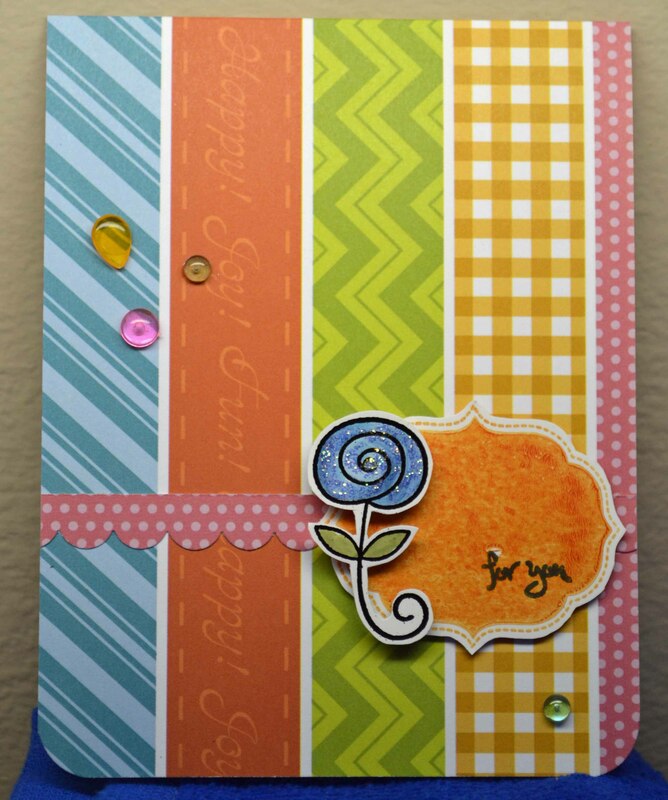 This pretty paper does all the hard work on this card, making it fast and easy to put together. 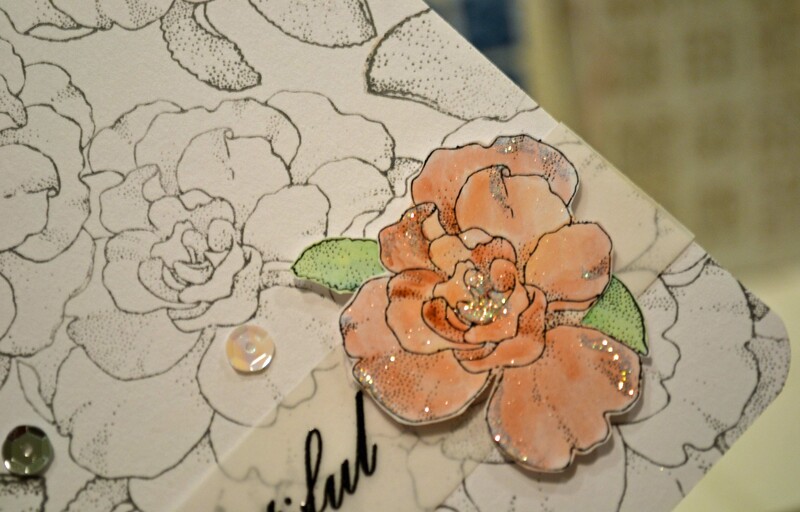 The stamps are from # Sweet (the flower was heat embossed in black and fussy cut, then colored with Distress markers), Stickles gives sparkle on the flower, and I edged a strip of the patterned paper using a Stampin’ Up scallop edger. The gems are Dew Drops from the Robin’s Nest. (attached using Ranger’s Glossy Accents. 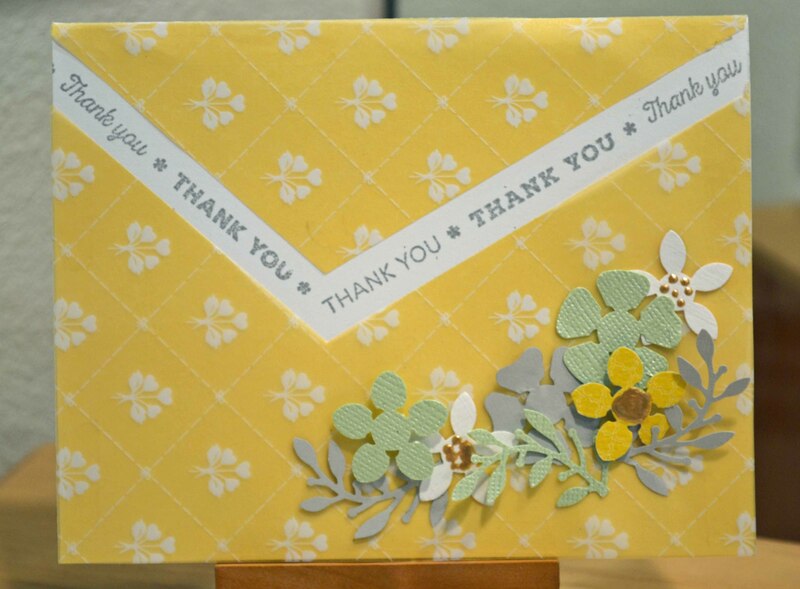 I made this a top folding card by cutting the patterned paper about a half inch longer than my base, then I scored the top of the patterned paper and attached that overlap to the back of the base card. There are a few more coming! The sentiment was stamped on scrap paper and rubbed with Distress wild honey and spiced marmalade. The diamond background was stamped in Hero Arts Wet Cement. 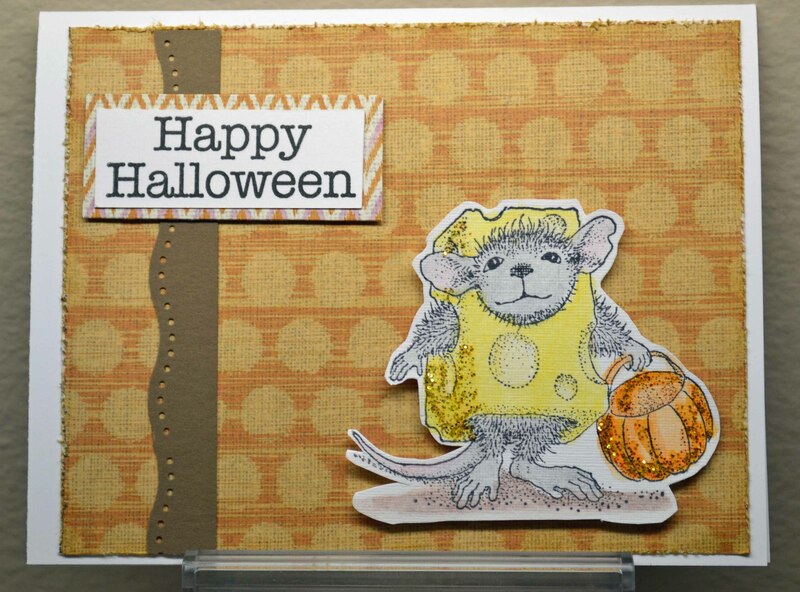 I don’t use a lot of cute animals, but I could NOT resist this House Mouse image from Stampendous! There’s that CTMH dotted paper again, broken up by a punched strip (EK Success). The sentiment is also CTMH. The mouse was colored with water color pencils and after everything was dry I added some yellow and orange Ranger Stickles. Mousie was popped up with Glue Dots. Fast and easy. This is not my favorite, but embracing my failings as the Imperfect Stamper I’m including it anyway. It feels too fussy and overdone. I had a strong urge to use navy with orange and I gave in to that urge. (Which is why sometimes urges need to be held in check.) All images from Close to My Heart. The scene and the sentiment are embossed in white; the edge was rubbed with navy pigment ink and sprinkled with Psychedelic embossing powder from Judikins. 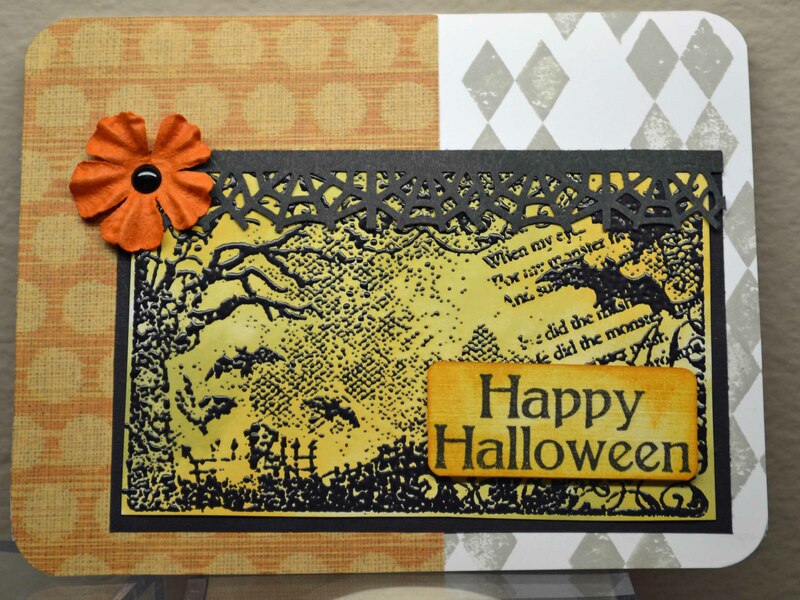 If you’re not tired of Halloween cards, check out these oldies or these. When I get a new stamp I’m like a 5-year-old. I can’t wait to ink it up and play, so my first go-round is usually a quick-and-easy card. How fun are these two new images from Hero Arts? Dontcha love the “Real Card” stamp? I can see myself using this a LOT! Hexagonal Background was stamped in Neon Pink; the sentiment was embossed using Zing Teal powder from American Crafts. I love the creamy opaqueness of these powders and I have several zingy neon shades! I believe the cardstock is from Stampin’ Up. I love that I can make quick cards using a few basics. Next up — stamping disasters from the Imperfect Stamper! 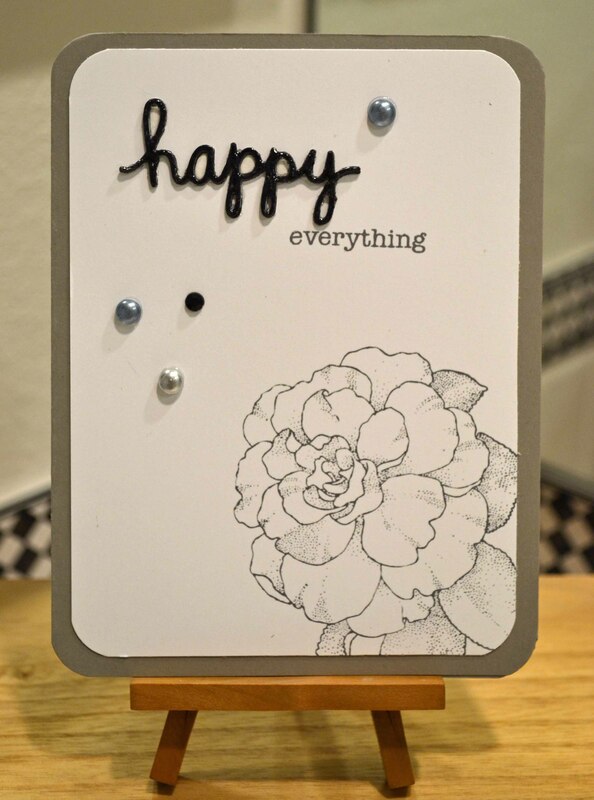 Fabulous Finds Friday — Oh, That Tim Holtz! Oh, Tim Holtz, what have you done? Come up with more cool stuff, that’s what! 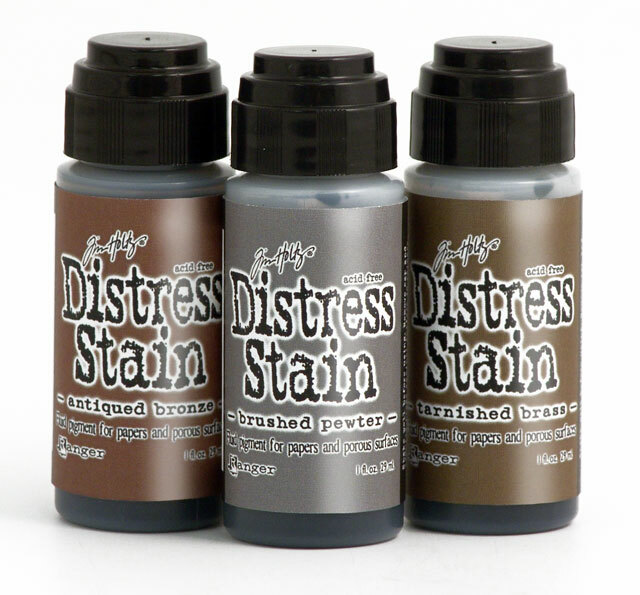 First up is new Metallic Distress Stains. Oh, how I am dying to try these! They are touted as being luminous, with a semi-translucent metallic finish, perfect for paper, ribbon, , fabric, wood … and even with the other translucent Distress stains for a layered effect. Like the others, they react to water. Oh, the mottling I can do! Then we have clear Rock Candy Distress Stickles in a larger jar with a built-in brush. 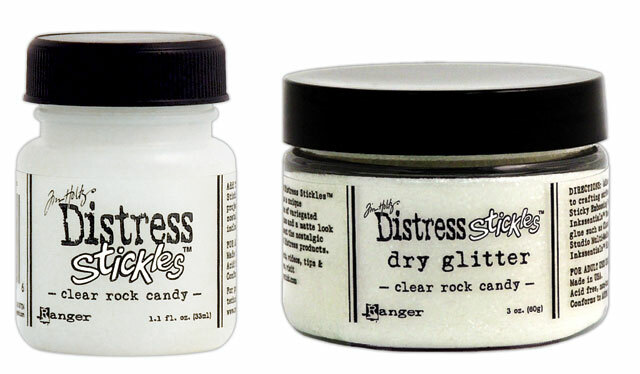 And new Distress Stickles Dry Glitter is sure to be a hit with its random particle sizes and shimmery clear finish. Yum. 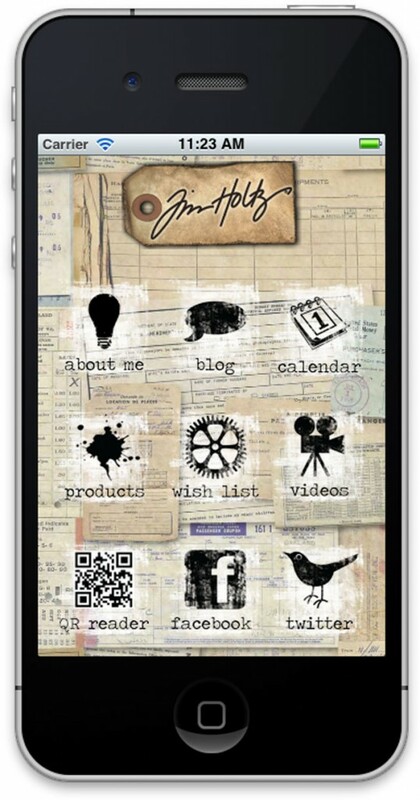 And one more thing… A FREE TIM HOLTZ APP! The new app lets you keep track of your Tim Holtz products, create a “wish list,” watch Tim’s technique videos, click on his blog, and more.